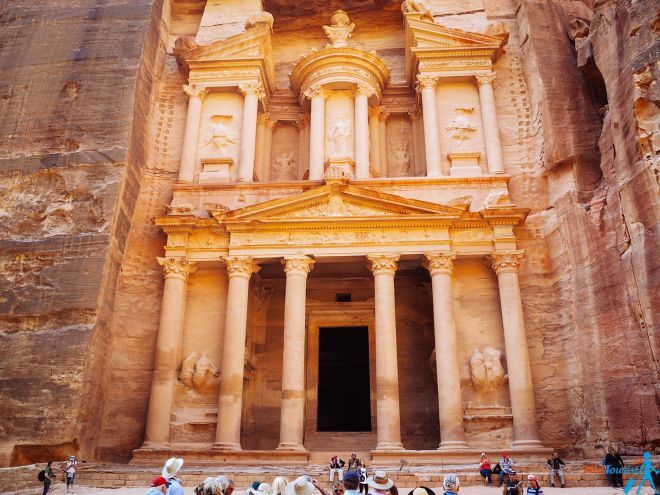 The history of the Ancient city of Petra dates back to 300 BC. It was a capital of a Nabatean Kingdom and it was founded thanks to the trade between Asia and Europe. Back then, it was a great trading hub with endless caravans passing by the city. The city was forgotten for centuries only to be rediscovered in 1812. Being “lost” for so long is the main reason why Petra is so greatly preserved. 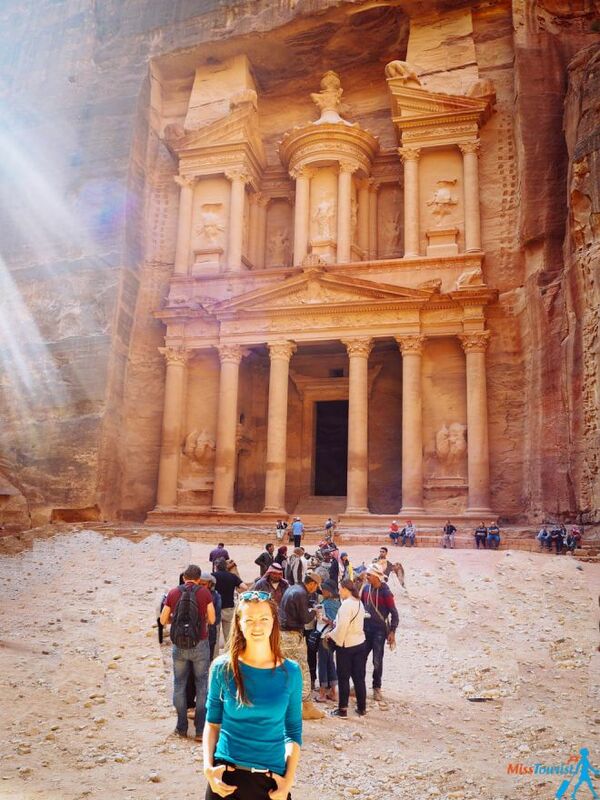 Petra in Jordan is by no doubt the most visited sight in the country! No surprise why – the place got hugely popular after the “Indiana Jones and the Last Crusade” movie and the fact that it was chosen as one of the New 7 Wonders of the World along with Chichen Itza in Mexico, Christ the Redeemer and other cool sights! 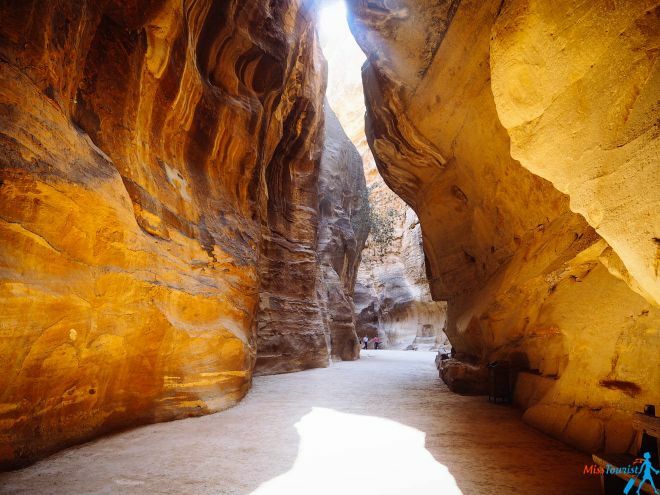 After entering, you will walk for about 1 km in a narrow canyon (called the Al Siq) to reach Al Khazneh (the Treasury). The alley is hardly noticeable even if you stand close to it and it was formed by tectonic forces that split the mountain 2 thousands of years ago. On your way to the Treasury admire the dazzling colors and rock formation. You will see numerous rock-cut thumbs, obelisks, fascinating water conduit system, carvings on pink sandstone cliffs, colonnaded streets and more such wonders. Petra is also called the Rose city thanks to the pink color of the stone of the cliffs. I have heard that before you could actually go inside the Treasury, but as there are way too many tourists now and they degrade the inside of the place, you are only allowed to look from the outside. NOTE: Please have your passport with you. Kids under 12 years old enter free of charge. 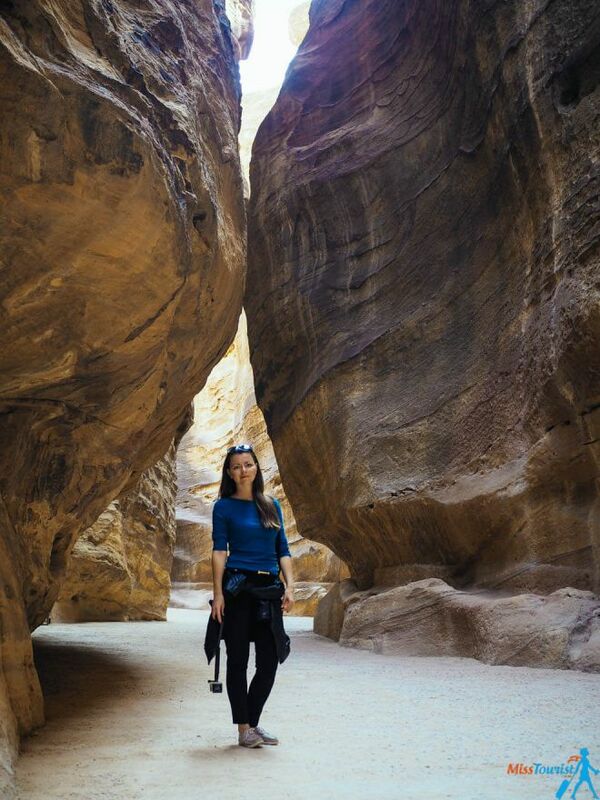 If you want an optional service of a tourist guide inside Petra, that is another 50 JOD (for the whole group). When you finally reach the site after the canyon, you will also see that you are not the only one admitting the New Seven Wonder of the World, there will probably be many other tourists there. Do you want to take an amazing picture with a great view and no tourists on it? Here is the tip: When you face the Treasury look at your right, there is a small cliff that you can climb. The tourists are hardly visible from there, but the Treasury is! Petra by night blew my mind, and I highly recommend it! At first, I was not sure if it makes sense to come back again to see it by night, but we did, and it was a magnificent experience! Petra by night and Petra by day are two completely different experiences, trust me. The Bedouins were singing their songs, more than 3500 candles were lit all along the path – it was such a mystical atmosphere that I won’t ever forget! During the summer (June to August) Petra can reach some extreme temperatures of 36 C (96 F) and believe me, you DON’T want to walk there in the desert during that weather. March to May and September to November is considered to the best time to visit. I was there in late November and you can see what I am wearing on the pictures. The temperature was mild and pleasant, but even then it got quite hot in the middle of the day. 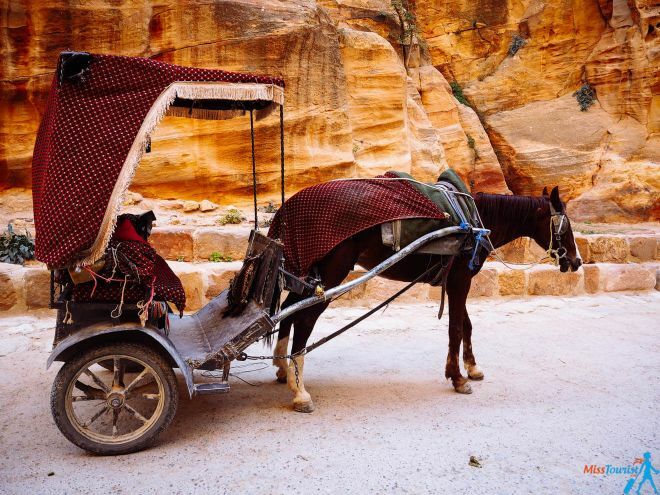 Amman to Petra by car – rent a car in Amman and drive yourself. The road quality is pretty good as they recently built a new road. Check this website, the rates can be as low as 22 USD per day per car (you should book for 4-8 days to get rates like this). 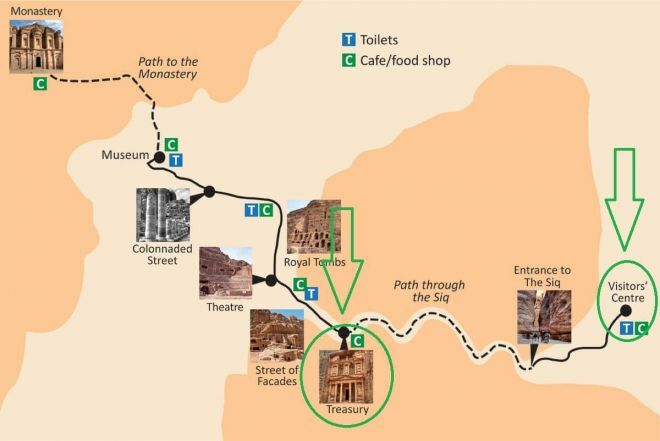 The drive from Amman city center to Petra entrance should take you about 3,5 hours. Get an organized transfer tour where a shuttle will pick you up from your hotel and deliver you back. The transfer is 73 USD per person. 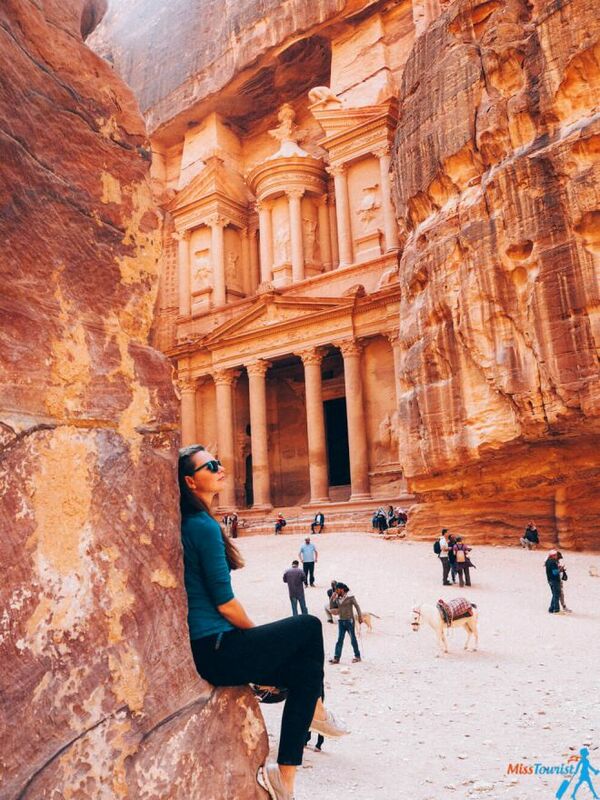 If you are a group of 3, it is cheaper for you to take this Petra Full Day Private tour from Amman, it will be 63 USD per person in this case. So, as you can see the car rental option is cheaper. The shuttle option is stress-free though – you will be picked you up from your hotel and delivered back. But if you are comfortable driving in a new country, I would suggest renting a car! I always choose this option as preferred if it is available and cheaper (example – Iceland, Croatia). The public transport between the two places is nonexistent (at least for now). 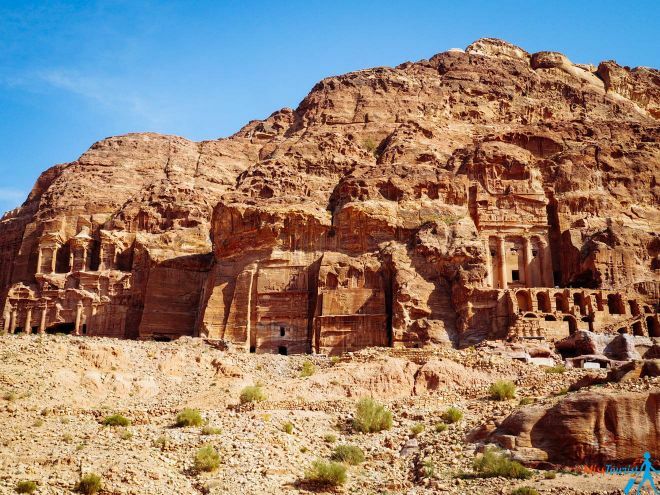 Looking for an accommodation in Petra? 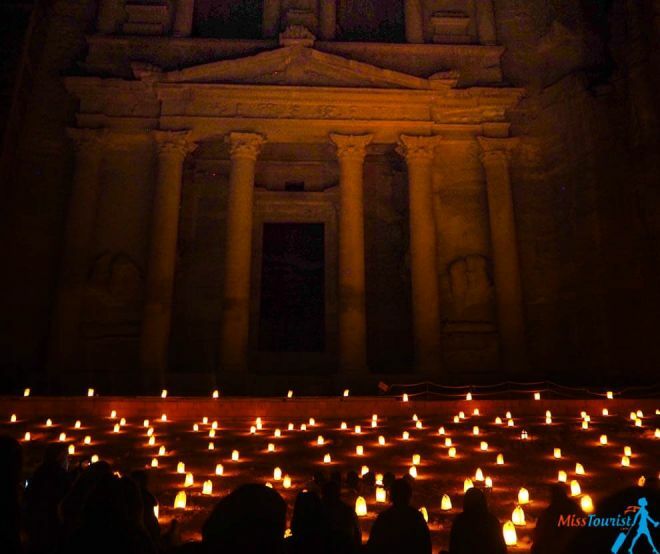 You should, at least if you want to see Petra by night! 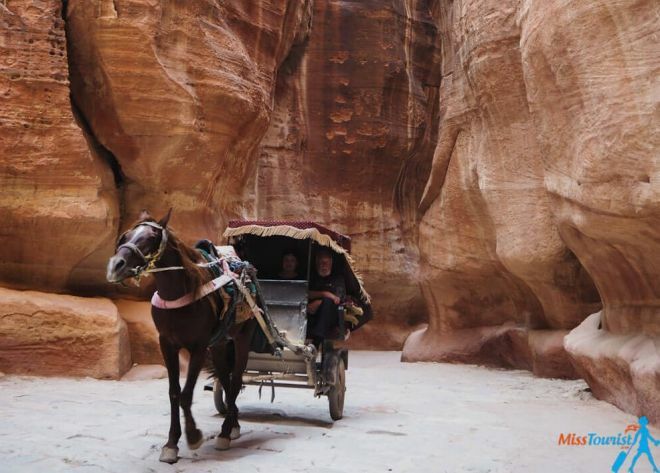 Stay in Wadi Mousa, a town nearby to the lost city of Petra. You can find everything from 1* to 5* hotel for any budget there! I stayed in Movenpick Resort Petra – it is an absolutely gorgeous hotel with a location literally in front of the Petra entrance. It is the closest resort to the Ancient City, I could see the entrance from my window! I loved the oriental decoration of my room which was spacious and luxurious. We were also upgraded to a bigger room, yay! Too bad I did not get to spend much time to spend inside. Who stays in the room when you have Petra right in front of you? I have heard they have fabulous dining options as well, but I only tried breakfast and it was fantastic! 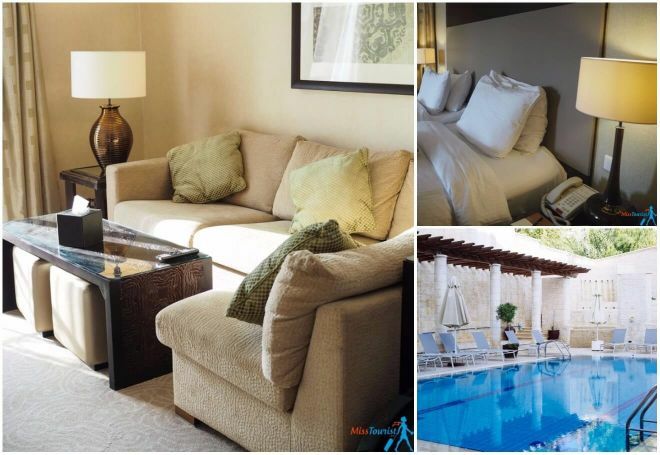 Luxury (US$ 150 and up): Mövenpick Resort Petra is the best one out there its spotless rooms, great service and amazing rooftop will leave you speechless. Totally worth its money! Tetra Tree Hotel is a 5 minute drive from Petra entrance, it features spacious modern style rooms and indoor and outdoor swimming pools! Middle (US$ 55 – 150): Marriott Petra Hotel is another great 5* hotel with an outstanding view that does not break the bank, keep in mind however, that it is 2,3 km away from Petra. 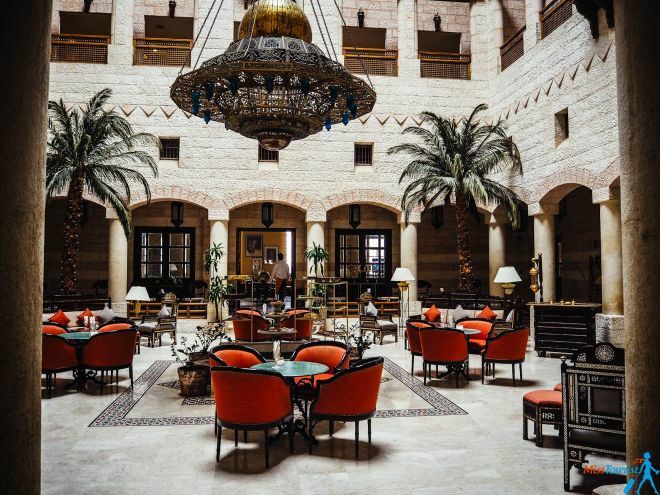 Petra Palace Hotel – a couple of swimming pools, warm decoration of rooms, proximity to Petra entrance – all these make the hotel worth considering. Budget (up to US$50): Peace Way Hotel is a great option for budget travelers, it is very close to Petra main gate, the staff is friendly and it has fabulous reviews! 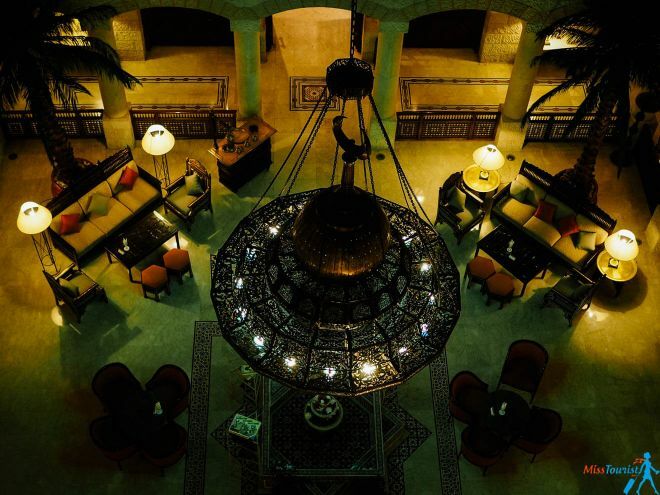 Hotel Cleopetra is, again, located in the center of Wadi Musa. The rooms are simple, but they are clean and they have private bathroom. Great value for money! 1) The Monastery (look at the map above) is the place carved into a chuck of the mountain. It is a way less touristy place inside Petra, but you need to walk a bit more to reach it and we did not have time unfortunately. It is about 2 hours walk from the Visitor Center to the Monastery (you can also take a donkey), but don’t forget you also need to hike up for 850 steps to reach it! But with way less crowds over there, it is worth the effort! There is a little cafe on top where you can get some refreshments, too. 2) Together with my friend Amandine, we also took a cooking class, which was educative and entertaining at the same time. I can totally recommend it in case you spend 1 full day in Petra. We took the cooking lesson between our visit of Petra by Day and Petra by Night. 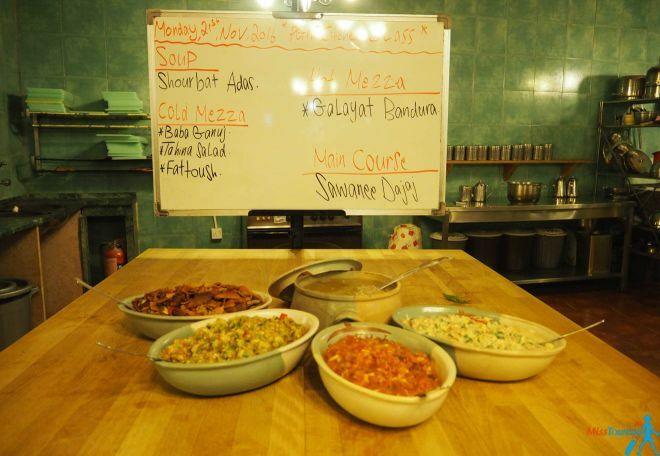 It was convenient as we had for dinner what we cooked during the lesson (and it was a lot of stuff!). I also go printed recipes of everything we cooked, so in case I ever have my own kitchen (I am a full time travel blogger for now), I will be able to treat my friends with some babaganush, mm! 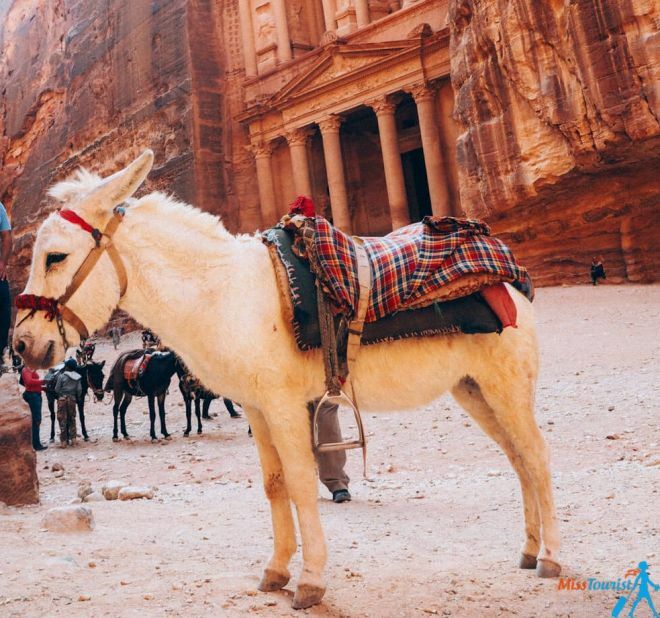 3) As an option, you can take a donkey ride back to the entrance of Petra. See, the thing is, it is quite a long walk from the entrance to the Treasury and in case you want to come back with a different road and maybe have a different experience, the donkey ride is an option. Petra became a New Wonder of the World for good reason, it is a fascinating place that I think everybody should visit when in Jordan! Yes, of course it is touristy and in my taste a bit overpriced, but the history and the remains of the Lost City are impressive, the place is simply awe-inspiring! 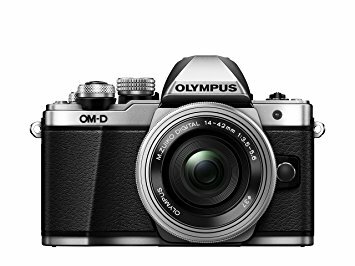 Plus, I shared a little discovery with you on how to save 100 US$! I hope my tips will help you to save some money on the entrance of this World Heritage Site and that all those sellers will not spoil your impression of the Ancient city! As my last tip, try to go as early in the morning as possible, this way you will avoid most of the tourist crowds. By the way, I found the souvenirs to be cheaper inside Petra comparing to the market near the Visitor Center. P.S. I have traveled to more places in Jordan, if you want to know more about Wadi Rum, Amman or Jerash, read this post! I also have tons of tips for you if you are heading to Jerusalem! 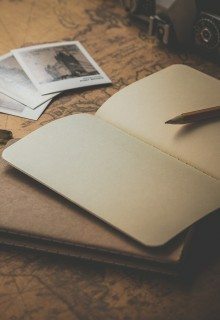 Was the post useful to you? Don’t forget to press a “Like” button, make me smile! Do you have any more questions? Ask away! It is my pleasure to help! Hi Im eyeing for this place thanks for the information and travel tips! Good job! We are hosting a tour with 50 people. This is our 3rd trip to Israel, but first to Jordan/Petra. The 2 big questions we are getting: Is Foreign currency accepted inside (US dollars) for the cart rides, food, etc? And how long does it actually take to walk…slower pace…from entrance to treasury? I see conflicting info. Thank you. no I believe USD is not accepted unless you agree with a specific person about it. As for the walking time, I am not exactly sure now, but i think it was about 20 mins (you can also take a carriage ride as I mentioned above). What airport do you fly into when visiting Petra from America?